“Work from anywhere in the world and not worry about paying for all the trips” is the motto of most of the individuals today. Isn’t it? There’s no one in the world who doesn’t want to travel to other places, get to know other countries and cultures, and listen to various new languages. But it’s hard to make that dream come true when we’re tied to the responsibility of a job. If you have to go to office from Monday to Friday, sometimes on Saturdays and Sundays as well, and do your work, then it is almost impossible to travel enjoying what it has to offer. However there are ways to make the dream of traveling and changing environment possible, if we put a little effort. And the secret is to find a job that you could first do from home and then take the work along, wherever you go. And guess what? If your dream is to travel without having your feet tied to the office, then, this article will guide you on how you can work from anywhere in the world. A great way to work and earn money is to create a high quality blog requiring a laptop and internet connection. You won’t have geographical barriers because every country has internet connection. If not, atleast most of the hotel provides. Besides, it gives you a lot of freedom in choosing what you want to work on and choose what to write about. If your dream is to work around the world and if you travel constantly, then why not make a travel blog? Share all your experiences through photos and articles aimed at your followers. The hard part about working as a blogger is being able to connect with people. However, it’s just a matter of spending a little time. But don’t think that as soon as you create blog, you will be able to begin to travel around the world. It takes a couple of months of hard work in order to make your work pay off. One of the main sources of money many travelers opt at the time of embarking on the adventure, is writing articles. There are many people on the Internet who own blogs or websites and pay good money to the editors offering high quality original content. The only problem is that there may already be a competition in the area. But it is not very difficult to find these opportunities either. They may well knock on your door or you can look for them on your own. The cost of an article of approximately 1,500 words can range from minimum $15 to $30. Writing a 1,500 word article is much faster than you think. The figure of “a thousand” may make you think it’s a lot. But when you’re writing in Word you realize that you’ve over crossed the number without even realizing it. If you put a lot of effort into it, then you can finish an article of that length in less than two hours and from any location. Don’t worry if you don’t have much knowledge about it. The important thing is to have good spelling and imagination. One of the most expensive things when traveling is the cost of airfare. But imagine not having to worry about that and in the process, you also earn money and travel from one place to another practically for free. Flight attendants make good career offering excellent income. But if you’re someone who wants stability in one place and time at home, then this job is not something for you. It may be a little heavy work, but you see the reward when you arrive in a different country on each flight. And with this, it offers, a new adventure. In addition, one of the great advantages is that many times you will be offered plane tickets at a discount to some destination. In the process of traveling and getting to know other countries, you will also be earning money to cover your needs and enjoy the stay. If you are a multitasker and organized when it comes to maintaining documents or keeping a record of information, then you could become an assistant. Previously, the only way to be someone’s assistant was to spend 24 hours a day with that person, or at least 8 hours a day. But with a boom in online jobs, there are individuals interested in someone to assist them without the need of physically being present. They just want you to do your job. Arranging appointments, buying airline tickets, making lists or keeping an agenda can all be done remotely, etc. But keep in mind that, it requires to sit on your computer and make phone calls. So there is a great demand for virtual assistants all over the Internet. And best of all, besides a good pay, it can be performed from anywhere in the world. Just try to match the time zone and the time your boss wants you to be available for a call or meeting. All you have to do is sit at a table in whatever country and do your job. You don’t need a technical expertise but requires basic things like discipline and communication. There is never a shortage of people who need assistance in a subject or area that they do not master in college or university. There are also those who just want to learn something new or improve in an area they like but aren’t good at. If you have something you think you can teach, then don’t keep that knowledge to yourself alone and instead take advantage of it. Previously, the only way to teach was to go into a classroom and see the pile of exhausted faces as they sat at a desk waiting for the time to leave. But with the ease of the Internet and programs like Skype for making calls or video calls, many choose not to leave home and watch classes from their own comfort. Why do it if there are online classes? In fact, anyone who want to teach would prefer without having to move to different places. You can become a teacher and teach subjects like: mathematics, economics, languages, design, marketing, and many others. You can offer your services as a freelancer on websites like Upwork, Udemy or Freelancer. Becoming a Youtuber today and making money is not a big secret. Beyond making money, you can also travel the world. And you don’t have to worry about having to be in one place for your work. What’s more! You can even document your travel in the videos you make, upload them to YouTube and earn money with them. So you can finance your trips all the time. You don’t have to worry about schedules and new destination, as it’s a part of the job. If you don’t panic about taking a camera, that’s an excellent idea. You don’t even have to worry about having a great idea for your videos. For example, document your travel. But if you don’t like the idea very much, just choose a theme that is flexible like trying food dishes in restaurants, reviewing other’s videos, and others. The point is, making videos is pretty easy and you just have to soak up a little bit of the editing process, if you don’t know much about it. So create your channel, record videos, upload them from anywhere in the world and… that’s it! You earn money from anywhere in the world and enjoy travel. But remember the income is fluctuating. If there is a possibility that your work is based on being on a computer typing, then you should take advantage of the opportunity. It is much faster and more comfortable to do it on a computer, allowing you to write wherever you are without any limit. If you are a born writer or if you only do it as a hobby, then don’t waste the opportunity to get a good job that will allow you to travel the world. All you need to do is write an ebook and put it on sale through Amazon. Earlier individual had to go through whole process to sell books. Because the only way for others to read them, was to buy the physical book in a store or bookstore. But now with the options to sell a book on Amazon, where you don’t even need to ask for someone’s help to put it on sale. It’s easier to move anywhere in the world, if you carry laptop and keep writing and publishing it for sale. On the other hand, you’ll also earn a lot more money than you can generate in a normal job working for hours. A very underestimated work is photography. Taking photos and then seeing them was a challenge a couple of years ago. But with high tech digital cameras, taking good images has become much simpler. Everyone can take a picture. Of course, you need a little “eye” to take a very good picture. So basically, you just have to worry about how special each shot is. Some people are born with a natural ability to do it, but others are not. That doesn’t mean you can’t learn to take good pictures. And most importantly, you can do it from anywhere in the world. In fact, the more places you visit, the better it will be for your work. Just take a picture of everything you think would look good and sell your photos in stock stores or other platforms. If you think you don’t have the “talent” for it, it might be a good idea to take a course. It doesn’t take more than a couple of weeks or months to learn photography. Anyone can sell products. But not everyone can set up a physical store to make sales. As it requires capital investment, time, and above all, being willing to settle almost permanently in one place. Today, there are plenty of ways to sell products, whether physical or info products like ebooks. But whatever it is, you can manage sales as long as you do it online. That’s why you should set up an online store today. There are many sites like Amazon, eBay, and OLX that make it easy for you to sell, if you don’t have a physical business. Although, the best option is to create your own store where you will not have any pressure and you can manage the best you like. You can set your conditions of purchase and sale, design it as you would like it to look and be more aware of the visits and sales made. And without the need to pay commission to the intermediaries like Amazon. If you want to have total freedom, you can sell products which are smaller in size and that you can take everywhere. For example, jewelry. Creating an online store does not take any time and is very simple. There are websites like Wix Store where you can create it in a few steps. One of the main reasons why we often limit ourselves to traveling around the world is the need and responsibility to have a place to return to. In this case, our house or apartment. But haven’t you ever thought about renting it while you’re away? You would only have to come back and check every time a guest leaves. While it’s not easy, it’s a good source of money that could generate even more than a normal job. Plus, you wouldn’t have to be there every day and you could comfortably schedule your trips. Rent your property permanently to one or more people. Put your house or apartment for rent per day (hotel type). In both the cases, you will be earning good money and not even being present. The only bad thing about the first option is that it basically leaves you with no place to live for, as long as it is occupied by someone else. So, go for second option. Websites like Airbnb are very good as you can put your property on rent at a cost per night. And people will make reservations directly on Airbnb website and indicate how many days they will stay. This way, you can plan your trips according to the days you will be busy and when you return, take a few days or weeks until you decide other destination. Keep in mind that you must keep the property clean at all times, even if it is not you who occupies it. Hiring a cleaning service daily or 3 times a week is very easy these days. 11. Is your canvas skin? Become a tattooist! Being a good tattooist is not easy. It takes a lot of practice or talent. But if you’re one of those who can draw, paint or are familiar with canvas and you’re good at it, then don’t think being a tattoo artist is a bad job. In general, tattooing offers a lot of money, if you do it well, of course. And it’s also a job that gives you a lot of freedom as to where you can do it. Yes, most of the time you’ll find that every tattooist sets up a studio and dedicates himself to making his art in them. But that doesn’t mean you can’t take your art to other parts of the world. All you have to do is visit a studio, ask for a pass to tattoo a certain time and the owners of the site are very open in accepting eventual tattooers. So cheer up! Anywhere in the world you can make a lot of money being a tattoo artist. You don’t need a very elaborate job that meets your two requirements: one that allows you to travel the world and makes you money. Many consider that being a waiter is not a “decent” job. But this is not true. Job is a job. Also, all over the world there are restaurants, bars, discotheques or cafes that require someone to attend customers and serve them. And you’ll be surprised to know that besides being a very easy job to find, it also offers a good salary and with tips which can practically double or triple depending on how you treat customers and how the customer thinks about you. In a restaurant or any place that serves food, what you are most looking for is a chef or kitchen assistant. Food is global. Therefore, anywhere in the world they will appreciate your culinary skills. If you’re a kitchen lover or have the skill for it, quit your office job and travel with the world showing off your chef skills. And if you’re certified, you can charge a lot more anywhere in the world. You also don’t have to settle down for long. There are many chefs who at the time of accepting a job, notify owner of the time they will last in the job. Being a chef is something that will make you enjoy your travel around the world even more. We all enjoy trying new dishes and eating whatever they put in front of us. But not everyone loves preparing them. But going to other countries means learning new recipes, ingredients and acquiring more knowledge. You will be fulfilling your dream of traveling the world and at the same time, mastering as a chef. To be able to communicate with other people is super important. The main problem in doing so is when there is a language barrier that doesn’t make the process any easier. This is the reason why everywhere you will find people needing someone who can act as an interpreter and thus be able to communicate with others with ease. Interpretation would be required for business or education reasons. But there will also be tasks involving conversation with someone else anywhere in the world. To be an interpreter you don’t have to limit yourself to being present at a conversation. Your clients can always call you and contact you for a job through any medium. You also have the option of translating texts that you can comfortably do from your hotel bed on the other side of the world or when you are spending a couple of days at home after arriving from a trip. If you are multilingual, take advantage of the very comfortable work opportunity it offers. And you will travel with work in hand around the world. To play, all you need is a good computer or video game console, depending on the requirement of the game. Beyond that, you don’t need anything else because no one tells you where to do it. All you have to do is contact a video game company. Of course, to get this job you need experience with individual or multiplayer games. Then it’s just a matter of playing it and finding out if it has any deficits, rating the graphics, etc. Just like when you complain that something could improve the game, that’s exactly what you should do. Don’t complain about it, but you have to let them know what to improve and what not to improve. After getting the job, you have to do is wait for an email with the link to the game to download. Sometimes you will receive a package with a CD or memory to install the game. Many a times, companies will even gave you the consoles for testing. So let’s go! It’s not at all difficult. Something that is undoubtedly in more demand today is a graphic/visual/user experience. There are many alternate names to it. You have no idea how many independent companies and individuals are looking for a exciting visuals for their businesses or websites. But not everyone has a talent for designing. That’s why everyone hires someone who knows how to do it. And if they know how to do it incredibly well, then the pay will be incredible too. Money aside, it’s a job where you don’t normally have to go to a site, unless you’re working for a company that does it. But if you’re a freelancer and offer services online, you can take all the jobs and do them from any place. To begin with, your job requires a laptop and tech products such as drawing pads, tablets., etc. accompanied by editing and drawing software programs. The work you deliver is via Internet and you would only have to send an email or upload the files to a download program to deliver. And to make your dream of travelling come true, all you have to do is choose your destination, pack your clothes and instruments and go on an adventure. You can offer your services as a graphic designer on sites like Fiverr, Upwork, others. Because first you would need to find a job that allows you to mobilize. If you want to resort to a job you get in the country you’re visiting, you have to take with you some money that allows you to spend at least some days without worrying. Because you don’t have to pay for food, hotel room or the place you rented for a few weeks. On the other hand, even if you find a job online, the day after you find it doesn’t mean you can travel. Because you need money for the plane ticket and the expenses you will make during the trip. You don’t have to save a lot of money, at least one month is enough. Suppose you find a job as a graphic designer, but that means you’ll earn either for work or salary. 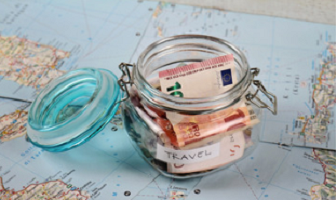 You can start traveling, but if you haven’t yet received your first paycheck, then you should look for money from your savings to be able to plan the trip. The work that will allow you to do it all over the world ensures that you don’t have to worry about that responsibility. But it’s hard to find a company who will pay for all your expenses first. Save some money to achieve that dream of working for the world, but don’t sour your life thinking you have to raise thousands of dollars to do it. What essential things you need to work for the world? To start working for the world, the essential things are a laptop that you can take with you everywhere, an Internet connection and enough clothes and other basic day to day items. What you will need most if you want to work for the world is undoubtedly the working tool for all Internet jobs: your laptop. So you can write your ebooks, translate documents, offer online classes and work any of the jobs mentioned above. But without a doubt, something that you will need almost the same as your laptop, is the Internet connection. If you don’t have a connection, you won’t be able to do anything even if you find your dream job. In part, it’s the hardest thing to solve and take with you everywhere because while there’s the Internet almost everywhere you travel, you don’t know how stable it is or whether the hotel you’re staying at really has a connection. That’s why it is recommended to buy a wireless Internet service that works in several countries. It’s not that you’re going to go and your service will be activated automatically, but if it’s a server that has offices in other countries, you are often given the option of calling the operator to activate a data plan on your wireless modem, those that look a lot like a flash drive. If you plan to look for a job in the country where you arrive, you should know that there may be a job interview or you may have to follow a dress code. For example, if you work as a waiter, we all know that they usually wear black pants or skirts and white shirts. Try to put in a pair of clothes that match the clothes you think you need for the job. And if you think there’s a chance of an interview in the future. Everything has its difficulty in life and the fact that something looks easy to the naked eye does not mean that it is so in its entirety. Working for the world is an incredible feeling. Because you travel many places, meet new people and most importantly keep on earning money. There are many jobs you can work while traveling around the world. But you should be open to many options. That is, be open-minded and don’t focus on getting just one of the jobs, aim for the first one that comes first and presents better conditions. You must plan well. There is time for enjoyment, but also for obligations and work is one of them. But what if you absorb yourself in having a good time and forget your responsibilities? A disaster will happen. It might happen that you spend a lot of time on outings, walks and visits to various places in the city until realizing that you didn’t do the job of the day. That will result in more amount of work to be done the next day and you will have to stay locked in the room working. So if you want to make it work from the beginning, make a schedule that guides you. You will see that you have time to enjoy the trip and also to do all the work you have in your hands. It is exciting to go from one place to another. And as soon as you return from your trip, you want to go to another country to experience everything it has to offer. But before you get back on a plane, make sure you spend a couple of days at home to rest and get everything in order. Even if you’re going to work traveling around the world, it’s not a good idea to jump from one plane to another. That is, don’t arrive from one destination and leave for the next destination, the another day. Take a couple of days or even weeks to check where you live, visit loved ones and organize your work. It’s a good idea to put your work duties in perspective before each trip. For example, that the work you did while traveling is perfect. Or that the time zone of the new destination to which you want to go does not affect your work. Also, making so many trips in a row can overload you. And even if you don’t believe, traveling is exhausting when you add it to your work. Don’t rush and take your time before visiting another country again. Take advantage of it to organize a new work schedule if necessary or simply to enjoy the feeling of being at home. Have you already taken the step to work around the world? Don’t wait any longer and tell about your experience in the comments below.